The Grand Vision has become a model for Michigan and the nation for how it incorporated citizen input into a set of community values and ultimately a vision for growth and development for the next 50 years. The major reports and documents produced by the Grand Vision provide a comprehensive and useful set of transportation recommendations and land-use analyses to guide our future decisions. The Grand Vision began in 2008 as a regional land use and transportation study that was conducted with more than $1.5 million in Federal Highway Administration funds administered by TC-TALUS. The consultant team completed the work on this contract in September 2010. Explains the Grand Vision guiding principles, project timeline, partners and calls to action. It includes an illustrative map that demonstrates a regional growth concept that is a reflection of community decisions made about transportation and land use preferences, as well as the preferences for economic growth, housing, agriculture, and the natural environment expressed at scenario planning workshops and through the Vision Decision community process. toolbox that is provided as a CD at the back of this document. When available, model ordinance language is provided in the electronic toolbox. Who Are Grand Vision Makers? Grand Vision Makers are individual community members trained to be conveners and facilitators of small-scale community meetings about the Grand Vision. They work on their own, but have the support of the Grand Vision CORE group as needed. You are a Grand Vision Maker! The purpose of Grand Vision Makers is to provide community members at large a low point of entry to participate in conversations about the Grand Vision with strong emphasis on grassroots actions aimed at short- term and long-term community outcomes. Grand Vision Makers convene informal gatherings of people in their own homes, businesses, or other places with a casual atmosphere. These hosts are provided with a set of tools and resources to ensure a successful conversation. 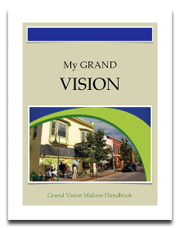 These tools include basic Grand Vision publications, Grand Vision working group updates, access to the latest Grand Vision presentations, a list of volunteers who can provide detailed instructions if necessary, and basic forms to help run, and keep track of the conversations. Hosts will also be provided with information to help encourage others to become hosts and continue the dialogue further. Training is available to hosts through this handbook, and use of online and in-person resources designed by the Grand Vision Maker team. 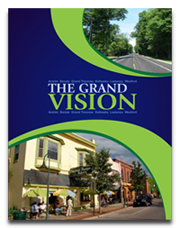 All 17 Grand Vision Transportation reports can be viewed through The Grand Vision Transportation Roadmap. Each report is information-rich with general topics, specific analysis, and graphic data. 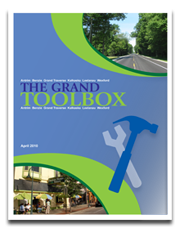 This roadmap is designed to give readers a cross-referencing system in order to quickly locate topics of interest within the many documents of the Grand Vision reports. Each report has a task number assigned to it, as an identifier for the consultants who prepared the reports.